For America’s rural and suburban areas, new challenges demand new solutions. Author Randall Arendt meets them in an entirely new edition of Rural by Design. When this planning classic first appeared 20 years ago, it showed how creative, practical land-use planning can preserve open space and keep community character intact. The second edition shifts the focus toward infilling neighborhoods, strengthening town centers, and moving development closer to schools, shops, and jobs. New chapters cover form-based codes, visioning, sustainability, low-impact development, green infrastructure, and more, while 70 case studies show how these ideas play out in the real world. Readers —rural or not—will find practical advice about planning for the way we live now. "It has been a decade since I read the first edition, and I was struck by how useful the information is to rural and urban alike. In many ways the title of the book is a misnomer, because this book is a great tool for new urbanists, small town enthusiasts and those that want to preserve and enhance the open space we all need." "The second edition of Rural by Design is worth the 20 years necessary for its update. Arendt's latest work is thorough and well researched.. This is a must -have book for every planner's library. The concepts are transferable and clear, and the rationale is directly on point and understandable to all audiences." "Randall Arendt has managed to take a great book and make it even better. This newest version has been expanded to make it even richer in content, including nearly doubling the number of case studies and graphics. It has also evolved to remain relevant to current planning philosophies." "Rural by Design is not just for practitioners in small cities and suburbanizing towns. New Urbanists will also profit from an array of strategies and examples for concentrating development and minimizing impacts. Most of all, it provides professors in planning and landscape architecture a text for their most important task: training students to apply ideals and principles in practice." "As a professor of urban planning, I have found the second edition of Randall Arendt’s Rural by Design an indispensable text for students pursuing sustainable urban planning and design. The book takes townscape planning to the next level with practical approaches that develop vacant land, redevelop existing neighborhoods and integrate the built with the natural environment. Transect planning, form-based codes, green infrastructure and conservation subdivision design are among many contemporary approaches illustrated in this updated edition. The book is easy to grasp, clearly written and illustrated with artful color graphics. The book’s appendix also features 84 case studies that reinforce townscape planning concepts serving as material for class exercises. In the process, Arendt persuasively demonstrates how townscape planning strategies can effectively implement sustainable development principles and practices. Rural by Design remains an essential resource for students and practitioners of urban planning and design." "The new edition of Rural by Design is an important addition to my undergraduate environmental planning courses and is a valuable follow up to the original classic text that became a driving force in the conservation design movement in the US. It builds on the original concepts while including broader coverage of non-residential development. As with the first, this edition includes a sequential topical format, thoughtful and concise interpretations, applicable case studies and excellent supporting graphics. It's a great achievement and will have a lasting impact on development here and abroad." "This updated version of the 20-year-old classic is a how-to guide to creating walkable towns in rural and urbanizing suburban North America, bursting with examples, many not yet built when the original book was written. It also shows how metropolitan residents can have a connection to nature that is so crucial for human settlements no matter the density. We are witnessing the end of sprawl, and this book provides the blueprint for how it is being replaced by environmentally sustainable, socially equitable, and economically successful ways of building the country. The book is truly a masterpiece." "Rural by Design represents a lifetime of experience and wisdom. Randall Arendt is a passionate proponent of the value of good design for planning more humane and healthy communities. His grasp of the history of planning new communities — and his deep personal involvement in making numerous plans across the United States — inform Rural by Design. This expanded edition includes considerable new information, notably concerning sustainability. 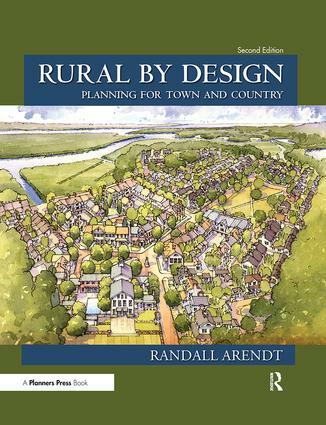 Arendt's clear and informative writing make Rural by Design an invaluable resource for practitioners, educators, and students in planning, landscape architecture, architecture, civil engineering, law, and real estate." "The new edition of Rural by Design is a definitive text. In 1994 Randall Arendtoffered an important template to counter suburban sprawl. Centered on the conservation subdivision, Rural by Design enlightened policy and regulations were recalibrated. In the past two decades, conservation subdivisions have protected 180,000 acres of natural and rural land. At the same time, Arendt was updating his repertoire. His new book is thoughtful and richly illustrated. Mitigating sprawl is still at the forefront, but it also addresses the growing focus on infill development. Analyses of pocket neighborhoods, complete streets, waterway daylighting, and habitat restoration reveal how sustainable human environments can be crafted in an urban setting. Arendt is at his best in a chapter devoted to greenways. Mixing historic principle and innovation, he presents a series of projects that guide development on lines of ecology, health, equity, and profit. Town planning is rooted in landscape architecture, a fact foreign to too many practitioners. Fortunately, Arendt celebrates this history. Like the early stalwarts of the profession—the Olmsted Brothers and John Nolen—he offers a pragmatic vision to protect nature and promote urbanism. Henry David Thoreau's adage "in wildness is the preservation of the world," inspired earlier generations, but Arendt is a visionary who sees livable cities as the key to the preservation of the world. This endeavor will define landscape architecture, and we are lucky to have Rural by Design as a guide. Rural by Design is not just for practitioners in small cities and suburbanizing towns. New Urbanists will also profit from an array of strategies and examples for concentrating development and minimizing impacts. Most of all, Rural by Design provides professors in planning and landscape architecture a text for their most important task: training students to apply ideals and principles in practice." Randall Arendt is a senior advisor at the Natural Lands Trust in Media, Pennsylvania, and the former director of planning and research at the Center for Rural Massachusetts, University of Massachusetts at Amherst.